Finalists, semi-finalists and quarter-finalists decided; such was the scenario on the second day of play, Friday 18th January, at the Seamaster 2019 ITTF World Tour Hungarian Open in Budapest. 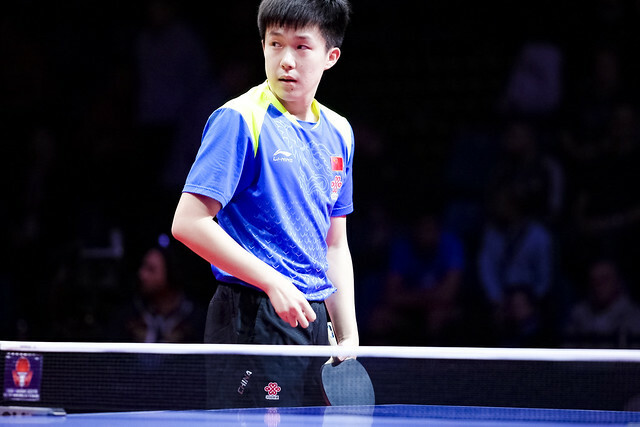 Furthermore, the day was unique in the history of the ITTF World Tour; situations occurred that had never been previously witnessed. Moreover it was a day for Hungary. …………Adam Szudi and Szandra Pergel, the no.8 seeds, flew the flag for the host nation. They beat the French pairing of Tristan Flore and Laura Gasnier (11-5, 11-9, 6-11, 11-8), followed by success against Russian qualifiers Alexander Shibaev and Polina Mikhailova (12-10, 11-7, 11-4) to book their place in the mixed doubles final. China’s Xu Xin and Liu Shiwen, the no.5 seeds, await. …………Illness forced Romania’s Elizabeta Samara, Germany’s Patrick Franziska and Hong Kong’s Lee Ho Ching to withdraw from proceedings in Budapest. Thus for the first time in the history of the ITTF World Tour both women’s doubles semi-finals were walk-overs. Wang Manyu and Zhu Yuling, the top seeds, were due to meet Elizabeta Samara and Bernadette Szocs, the no.7 seeds; Chen Meng and Sun Yingsha, the no.3 seeds, were scheduled to face Doo Hoi Kem and Lee Ho Ching, the no.2 seeds. …………Also for the very first time in his career Vladimir Samsonov of Belarus booked a quarter-final men’s singles place at an ITTF World Tour tournament without playing a match. The no.10 seed, in the opening round he received a walk-over against Germany’s Qiu Dang, in the second round he was due to face Patrick Franziska, the no.7 seed. …………Sun Yingsha won the battle of the two most recent Youth Olympic Games gold medallists; the winner last year in Buenos Aires, she beat Chinese national team colleague, Liu Gaoyang, successful in 2014 in Nanjing, in five games (11-9, 16-18, 9-11, 11-5, 11-8, 11-4) in their second round women’s singles encounter. …………Portugal’s Fu Yu performed the recovery of the day, in the second round of the women’s singles event against fellow qualifier, Germany’s Petrissa Solja, she fought back from a three games to nil deficit to emerge successful in dramatic fashion (5-11, 9-11, 7-11, 11-7, 16-14, 12-10, 13-11). …………Chinese pairs prevailed in the men’s doubles semi-finals. Liang Jingkun and Xu Xin, the no.5 seeds, beat French qualifiers, Tristan Flore and Emmanuel Lebesson (11-6, 11-7, 13-11); Fan Zhendong and Lin Gaoyuan, the no.2 seeds, overcame Hong Kong’s Lam Siu Hang and Wong Chun Ting, the no.3 seeds (7-11, 11-7, 12-14, 11-7, 11-3). …………Runner up two months ago in Austria; in the second round of the men’s singles event, Xu Xin, the no.2 seed, extracted revenge but only just. He beat colleague and nemesis Liang Jingkun by the very narrowest of decisions (11-6, 11-8, 7-11, 10-12, 9-11, 11-6, 13-11). …………Top seed and defending champion, China’s Fan Zhendong emerged successful in the men’s singles second round as did colleague Lin Gaoyuan, the no.3 seed and Brazil’s Hugo Calderano, the no.4 seed. Fan Zhendong beat Chinese Taipei’s Chuang Chih-Yuan, the no.9 seed (11-9, 15-17, 11-7, 11-9, 7-11, 14-12), Lin Gaoyuan accounted for colleague Fang Bo (11-8, 11-9, 4-11, 8-11, 11-9, 12-10). Meanwhile, Hugo Calderano ended the hopes of Sweden’s Kristian Karlsson, the no.14 seed (11-4, 11-8, 8-11, 11-3, 12-10). …………Russia’s Alexander Shibaev, China’s Wang Chuqin and Korea Republic’s Lim Jonghoon claimed men’s singles quarter-final places contrary to status. Not seeded, in the second round, Alexander Shibaev beat Hong Kong’s Wong Chun Ting, the no.5 seed (11-8, 8-11, 8-11, 11-6, 11-7, 11-5); Wang Chuqin overcame Frenchman, Simon Gauzy, the no.13 seed (8-11, 3-11, 11-5, 11-5, 11-3, 11-9). In an even closer contest Lim Jonghoon, the no.12 seed, accounted for England’s Liam Pitchford, the no.8 seed (11-7, 9-11, 11-6, 11-13, 8-11, 11-9, 14-12). …………The leading names in the women’s singles event all booked penultimate round places as China secured every step of the podium. At the quarter-final stage, all Chinese clashes witnessed success for Zhu Yuling, the top seed, against Chen Xingtong, the no.6 seed (11-4, 11-4, 11-8, 11-8) and Liu Shiwen, the no.4 seed, in opposition to qualifier Sun Yingsha (11-6, 11-8, 11-9, 13-11). In the opposite half of the draw, Wang Manyu, the no.3 seed, overcame Portugal’s Fu Yu (11-9, 11-3, 8-11, 11-5, 11-4); Chen Meng, the no.2 seed, ended the hopes of Romania’s Bernadette Szocs, the no.10 seed (8-11, 7-11, 11-6, 11-7, 11-5, 11-4).